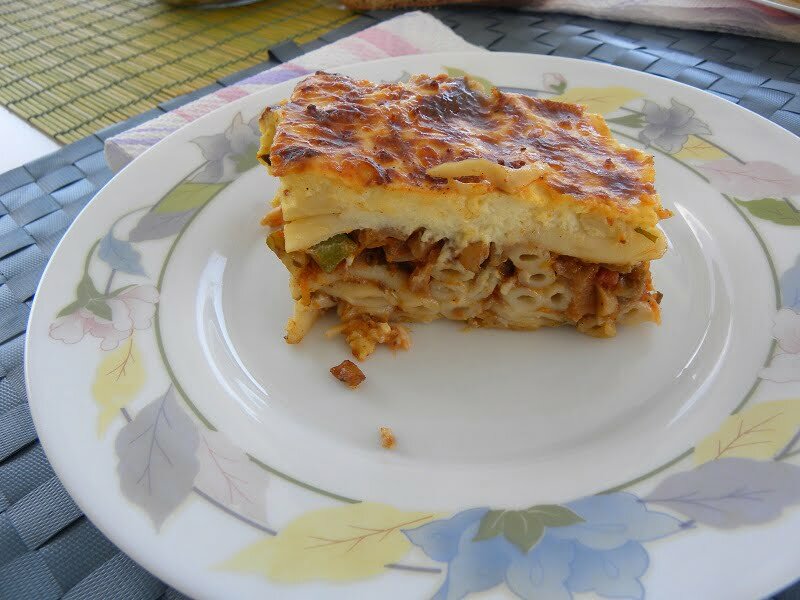 Pastitsio nistisimo (pr. Pah-STEE-tsio Knee-STEE-see-moh) is a vegan pasta casserole dish made with tubular pasta, vegetable filling and topped with a vegan faux béchamel sauce. The same dish can be made vegetarian using the same filling but adding a real bechamel sauce on top. This is a staple food for all Greek families and I cannot think of anybody who does not like this dish. However during lent we abstain from eating any kind of meat or products derived from animals and although I have seen some vegetarian recipes, my recipe does not have a vegetarian béchamel on top but includes a topping without any milk or eggs in the “faux béchamel”. Think of Shepherd’s Pie. For this reason I decided to make my own recipe which we can enjoy during Lent. To replace the meat sauce, I decided to make a vegetable sauce and added a variety of vegetables and herbs. Although normally I would add only the canned tomatoes, I decided to added an extra cubed tomato for some extra colour in the dish and the carrots, combined with the onions, added a lovely sweetness to the filling. You can use the same filling to make a vegan Moussakas or vegan Papoutsakia. Although I do not have a garden but merely a small balcony, I grow a few herbs in pots and I’ve recently bought some more herbs so you will be seeing a lot of these in my recipes and of course the difference is amazing. In this recipe, I used fresh parsley, rosemary and thyme from my pots and laurel I picked that morning after walking at Hymettus mountain, which added a lovely aromatic taste to the sauce. The original recipe is included in my cookbook Mint, Cinnamon & Blossom Water, Flavours of Cyprus, Kopiaste! Prepare the vegetable filling: Heat the olive oil in a sautéing pan and sauté the onion until soft. Add the garlic and sauté for a few seconds until fragrant. Add the eggplant (aubergine), the mushrooms, the carrots and the zucchini (courgettes) as well as the celery and sauté until they are soft. Add the wine and cook for a few minutes for the alcohol to evaporate and then add the tomato as well as the tomato puree, bay leaf, oregano, rosemary and thyme. Season with salt, pepper, cinnamon and allspice, add the water and simmer until the vegetables are cooked and remain with a thick sauce. When they are cooked discard the bay leaf and mix in the parsley, dill, oregano, rosemary and thyme. Cook the pasta: Meantime, bring the water to a boil, add salt and cook the pasta al dente, a few minutes less than the package instructions. Remove from the heat and cool the pasta under running water. Drain, and wet the pasta with the olive oil. When ready to use beat the egg whites and add it to the pasta, together with the cheese and a couple tablespoons béchamel sauce and mix. Assembling the dish: Layer half of the pasta in the Pyrex and add the vegetable filling on top. Add the remaining pasta on top and cover with the béchamel sauce. Sprinkle with some grated cheese and some cinnamon on top. Bake in a preheated oven to 180o C / 350o F (or 160o C / 325o for a convection oven) for about 45 minutes or until golden on top. Let it cool before cutting into portions. I particularly love the heart photo and what a fantastic bechamel for the pastitsio too. I have been waiting to see this delicious dish after you hinted with your bechamel sauce. It does sound delicious and I can see why the family would rave about it and want seconds. I’d been wondering about how to make a vegetarian pastitsio. This sounds fantastic! I have never heard of this dish, but then i am not a greek, it looks so yumm, it islike a real comforting food. This sounds delicious … telika to pastitsio mas mporei na parei polles morfes! Love this one Ivy; it is flavorful and hearty and I am sure you do not even notice the missing meat, or even want it in any way. this looks delicious!! thanks for your entry, dear ivy. I love this version, Ivy! It has so many delicious goodies in it! The heart photo is so creative and what a beautiful verdant green! I would love to try your pastitsio someday! I don’t think I can ever get enough pastitsio recipes Ivy! This vegetarian version looks delicious and tasty! I like the vegetarian version Ivy. I see that u used the vegan bechamel in this! I never had pastitsio before. I saw your pic in the gallery .. very nice idea! This dish looks really delicious and healthy. Mmmm this has a lot of wonderful ingredients. I love your collage as well. Very nicely done as always! Great recipe. I’ll keep this in mind for lent. Thanks! What a wonderful creation. I’ve never tried this, but I wish I could have some right now. Lovely images too Ivy. Your Lenten version of Pastitsio comes with a wonderful and suprising result. You know how one is always hungry during Lent – this dish can alleve that. What a nice recipe, Ivy! Your Pastitsio looks wonderful. this looks so good! And WOW! A very innovative and I’m sure a wonderful recipe of a dairy and milk free bechamel. A lovel idea of showing all the steps in one picture, looks beautiful too. Appreciate ur effort. Good and nice presentation!